"Assume there are no problems, till you actually find them"
We exist to enable women to realise their potential across every stage of their career. To bring fulfilment, recognition and reward to individual women and, as a consequence, market leading performance and higher staff satisfaction to their employers. The Women’s Sat Nav to Success™ is pioneering and unique. It combines in-depth understanding of the realities of the workplace with the implications of the complexities of human psychology to provide practical, proven and sustainable solutions to the challenges for women of getting the work they want for the rewards they deserve. 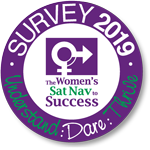 We use The Women’s Sat Nav to Success™ assessments to identify individual’s priorities for fast-tracking progression, and make it happen through the application of the critical SatNav strategies. We don’t tell women what they should do; we provide the best route through to what they chose via coaching, mentoring and training programmes and fast start workshops. Our clients are organisations, individuals, professional bodies and networking organisations.